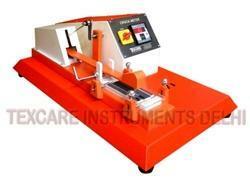 We offer a wide range of Fabric Testing Instruments to our clients. These are designed using quality material and latest technology. Our range is easy to use, operate and is ideal choice for Textile, Home Furnishing, Coated and Non-woven Fabrics, industries. We follow International Standards of ISO, AATCC, BIS, ASTM and BS. 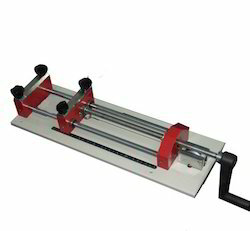 Bursting Strength Tester Analogue is used to determine the bursting strength of any fabric, leather, paper and card board. Bursting Strength tester works on hydraulic pressure created in cylinder through glycerin. A test specimen is held between two annular clamps under sufficient pressure to minimize slippage. The upper clamping surface which is in contact with the test specimens has a continuous spiral grooves. A circular diaphragm of pure gum rubber is clamped between the lower clamping plate & pressure cylinder so that before the diaphragm is stretched by pressure underneath it the center of its upper surface is below plane of the clamping surface. The equipment is fitted with a motor driven cam mechanism, which increases fluid displacement on the lower side of the diaphragm at a specified rate. The equipment is fitted with an arrangement, which automatically brings down the pressure and stops the motor on completion of the test cycle. A maximum reading type pressure gauge gives the bursting pressure. The equipment is raggedly designed to give a long & trouble free life. The components are brighter chrome plated or painted in metallic paint to give the tester an aesthetic appearance. Light Fastness Tester is used to determine the colour fastness of any type of dyed and printed material against day light. The sample is exposed to MBTL (Mercury Blinded Tungsten Lamp) inside chamber. Temperature of inside chamber is maintained by water cooling arrangement. This Light Fastness Tester is used in fixed and moving type of drums. Water: Use of distilled water only in the water circulation unit. 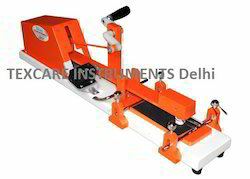 Rubbing Fastness Tester is used to determine colour fastness of dyed or printed textile or leather against rubbing, either under dry or wet conditions. In crocking test and moving brass finger of specified shape and size rubs against the test specimens under test and the amount of colour transferred to a piece of abradant fabric fixed over the base of the moving finger are graded with the help of standard grey scales to evaluate the colour fastness against rubbing. Crock Meter Motorised is having digital ore-set counter. Mild Steel body painted with a metallic finish. With 2 Nos SS Spring Clip for holding crocking cloth. With 2 Pack of Crocking Cloth (Pack of 100 Pcs.). Crock Meter is used to determine color fastness of dyed or printed textile or leather against rubbing, either under dry or wet conditions. In crocking test and moving brass finger of specified shape and size rubs against the test specimens under test and the amount of color transferred to a piece of abradant fabric fixed over the base of the moving finger are graded with the help of standard grey scales to evaluate the color fastness against rubbing. In manual crock meter there is handle rotate clockwise by hand. We are amongst the foremost manufactures of Digital Button Snap Pull Tester. The offered tester is used to determine the holding strength of the button or snap within the stitched garments or fabrics. Manufactured as per international quality standards using quality-assured components, the provided tester is a state-of-the-art production. Our clients can avail this Button Snap Pull Tester at market leading rates within promised time frame. We are manufacturing Digital Button Snap Pull Tester operated by geared motor. With 4 Nos of Grips used for all types of Buttons, Snaps, Rivets, Ornaments used in garment. Fabric Extensometer is used to determine the stretch and recovery of the fabric in case of both woven and knitted fabrics. The fabric can be loaded with weight from 1 to 5 Kg. The apparatus consist of one fixed jaw and a moving jaw for fabric clamping, the loading device, and fine lead screw. The unit has an arrangement to provide tension by applying the load with a constant rate of extension. The specially designed scale graduated in two scales, 0-50% & 0-300% for showing the stretch % for woven and knitted fabrics respectively provided. It has been specially developed equipment to evaluate stretch or extension of woven and knitted fabrics. Two scales graduated 0-50% for woven fabrics & 0-300% for knitted fabrics. Possess stainless steel knobs for tightening the jaws for holding samples. Ensures smooth, precision-engineered components for exceptional performance. GSM Round Cutter is specialized instrument used to determine the GSM (Grams per square meter) of textiles material (Woven, Non Woven or Knitted, Fabrics), This GSM Round Cutter can be used for virtually any type of material including Film, Foam, Carpet, Paper and Board. 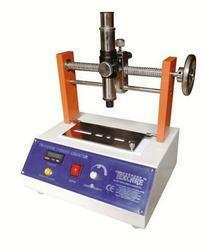 GSM Round Cutter is supplied with all accessories. To determine the GSM ( Grams per squire meter) of any fabric, Films, Paper and rubber. 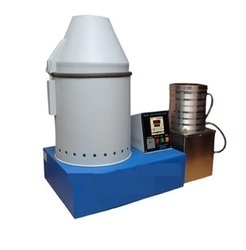 Air Permeability Tester is used to determine, the volume of air passed through any textile fabric. This system consists of an arrangement for holding the test specimens between two flat faces so as to expose a known area to the flow of air through it, a vacuum system to draw air through the exposed area of the test specimens. There is an arrangement to measure the volume of air flowing through the test specimen, and arrangement to measure the pressure drop between the faces of the test specimen. The test specimen is hold between two round-shaped grips. The grips are lined with rubber gasket to avoid the leakage of air through the edges. The two grips can be held the test specimens with the help of a hand operated screw mechanism. The vacuum needed to draw the air through the test specimens is created with the vacuum pump supplied with the instrument. The vacuum pressure is measured by the digital manometer (or manometer tube) in terms of mm of water level & airflow is measured by the Rotameters attached with the instrument. The Air Permeability Tester is metallic paint & bright chrome plating finish for corrosion resistant finishing. Power 230 V AC 50 Hz. 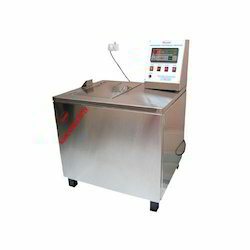 Washing Fastness Tester is used for determining colour fastness of textile materials to washings. This is attained by mechanically agitating a specimen of textile in contact with pieces of specified adjacent fabrics in a soap – soda solution, before being rinsing and dried. The change in colour of specimen and stains of the adjacent fabrics are assessed with standard Grey Scale. 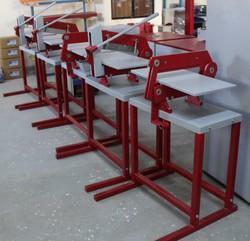 This washing fastness tester is used for any dyed or printed textile. It works as Wash-O-Meter, Launderometer, Colour Fastness Tester. 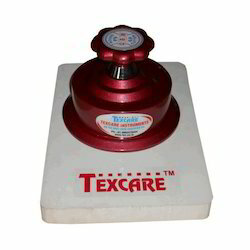 Washing Fastness Tester is completely made of Stainless Steel for long life operation and durability. Digital Temperature indicator and controller is used to maintain a particular temperature accurately. Digital timer is used with pre-set keys. Copper immersion heaters are used for quick temperature raise. Maximum temperature can be raise up to 980 C.
Inching facility is provided for loading and unloading of beakers. Special quality silicon gaskets are used to prevent leakage and having long life. 200 Nos. SS Balls are supplied with machine for beating samples during washing. 500 Nos ( 5 Pack of 100 Pcs.) Adjacent Fabric is supplied with machine. Button Snap Pull Tester is used to determine the holding strength between button/snap and fabrics/garments. The results come directly on the Dial Gauge in Kg. It works as Button Strength Tester. 4 Nos. of Grips supplied for all types of button/snaps. Swatch Cutter is used for making swatches of any fabric quickly & conveniently. The specially designed equipment can cut swatches in multiple layers up to a depth of 20mm. This Zig-Zag cutter can make samples out of any type of fabric (woven/knitted or non woven) with the special imported blade.